Currently showing at Forest Heights Community Centre till the end of February 2016. It moves to Doon Pioneer Park in March. ‘Neighbourhood Voices Interactive’ , a traveling digital exhibition is the culmination of may work as the City of Kitchener’s 2014 Artist in Residence. It’s currently showing at Forest Heights Community Centre, 1700 Queen’s Blvd., Kitchener, Ontario, Canada and is featured on the Armodilo website. Armodilo is the a Waterloo Region company that designs and manufactures the beautiful tablet stand and graphic band display I used for the traveling show pictured about. The unit consisting of an iPad mounted on a stand, headphones, an informational banner and an iBook installed on the tablet that gives viewers a chance to watch or read the stories gathers during the project. Throughout my residency, I connected with Kitchener residents through the city’s community centres. People told me their everyday stories and I turned them into short, touching portraits of neighbours from across the city. The mobile unit returns the stories to the community centres where they originated. 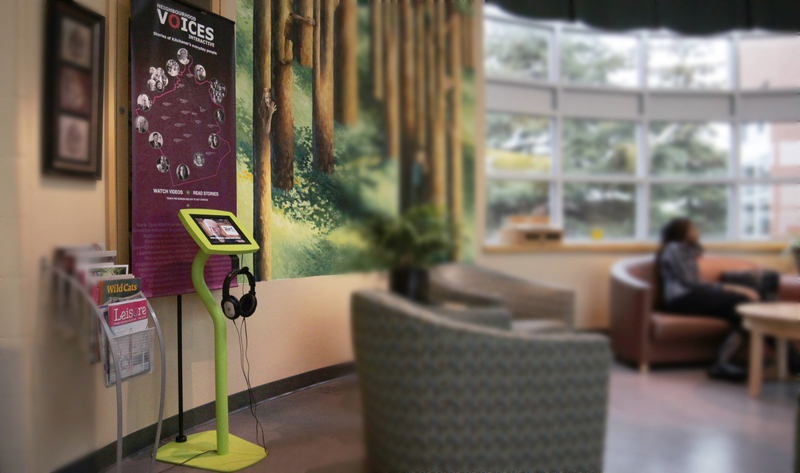 ‘Neighbourhood Voices Interactive’ will circulate from centre to centre for month-long exhibits.